If you are looking for a gift for your young children – something that they will love and something that they can keep forever – there’s really nothing better than a toy teddy bear. Young girls and boys love toy bears and the best ones around – if your kids really deserve a treat – are Steiff Bears. Steiff Bears were first made by the Steiff Company, in Germany in the early 20 th century. Richard Steiff joined his aunt’s company in 1897 and spent a lot of time in the local zoo, watching and sketching the bears. These observations led to the first Steiff bear being made by Richard, in 1902. This was the first of thousands and Steiff bears are now some of the most valuable in the world. They are hugely collectible and seen as antiques, and some one-off Steiffs have been sold for as much as $100,000! There is something about these bears that people just love, and that’s people of all ages too. This is another reason to buy your kids Steiff bears as gifts, because these are toys that they are likely to hang onto – at least until they are old enough to realise how valuable they are. These bears could then be passed down as family heirlooms. Thankfully new Steiff bears don’t cost anywhere near as much as antiques and you can pick a nice one up for way under $100. This may seem like a lot for a toy, but you can also see this as an investment and something that your child and perhaps their children will cherish. 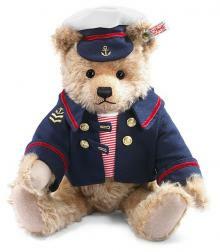 To take a look at World of Bears - Steiff Bears retailer extraordinaire for a wide range of cute teddy bears.